As a golfer, you may not have heard of the Abaco Islands of the Bahamas before since it is best known for its’ boating, scuba diving and fishing. That all changed when ‘The Abaco Club on Winding Bay’ opened in December of 2004. Although you can only play this course once without buying an equity membership, it is an experience you can not afford to miss if your goal is to play all the top courses in the world. The Abaco Club is the brainchild of British entrepreneur, Peter de Savary who decided to build an exclusive retreat for affluent people who want both privacy and relaxation. He spent four years searching the Caribbean for the ideal place to build his dream resort until he discovered Winding Bay. What he found was 500 acres of jungle and bush bordered by two miles of white sandy beach on the west, majestic 65 foot cliffs on the east and a range of elevation changes that are not typical in the Bahamas. 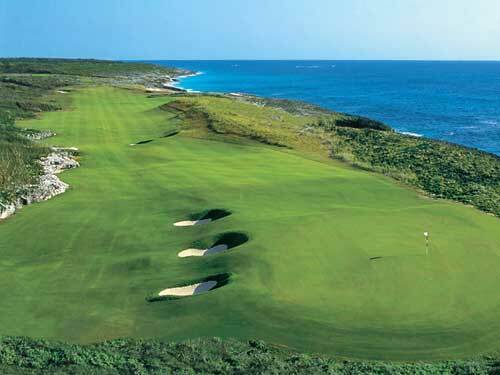 The Abaco Club plays to 7123 yards from the tips and as with most links courses there are not too many flat lies. The advantages are the fairways that are generous and some are banked so your ball has a tendency to funnel back to the fairway. The greens are huge and very dramatic but are firm and true. Your approach shot is so critical here because not only do you have to be on the right plateau but everything falls away to the greenside swales. The course starts out rather sublime but it doesn’t take long before its teeth begin to show. Hole #4 is your first opportunity to appreciate the tremendous vista of Winding Bay’s sandy beach and all the dramatic colors of the Caribbean – a great par 3, towards the ocean, where the wind will certainly be a factor . 5 through 8 are challenging holes that continue to offer you magnificent views of the ocean before you wrap back behind the outward holes to views of the Yellow Wood Creek, famous for it’s bone-fishing. Once you climb up the steep slope to the tee on 15, you quickly realize that Mackenzie and Steele have saved their best till last with a magnificent panoramic view of the entire property. Holes 15 and 16 have intimating tee shots carved around a daunting stone quarry and the downhill par 3, 17th will remind you of Pebble Beach where you can hit anything from a wedge to a three wood depending on the wind direction. My favorite however would have to the par 5, 18th. When I stood on the tee I swore I was playing Ballybunion in Ireland. The wind had started to kick up and the waves were crashing onto the cliffs sending a spray of mist across the fairway illuminating a rainbow in our path. Now I know I have truly been blessed.